One of my students at JP Catholic, Sr. Mary Agnes, has a post up on her new blog about the absentee and abusive fatherhood she has witnessed in her work. She is part of a religious community which is devoted to caring for abused children. She knows what she is talking about. Her order runs an orphanage in New Hampshire, St. Charles,--and, as CBS news explained in a story they did on them, they really do "run" it. "Original sin attempts, then, to abolish fatherhood, destroying its rays which permeate the created world, placing in doubt the truth about God who is Love and leaving man only with a sense of the master-slave relationship." 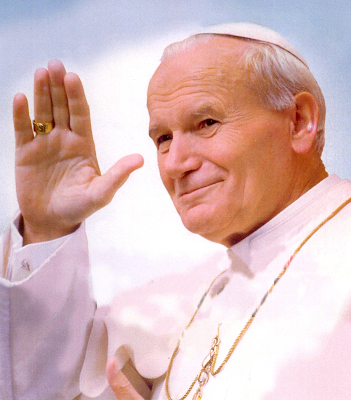 --John Paul II, Crossing the Threshold of Hope (Toronto: Knopf, 1994), 228 (emphasis in the original). Thank you Professor Barber! I love this quote from JP II. Dads: when you are a good father to your children, you are really helping them to overcome the damage done by original sin!